President Trump’s attorney Rudy Giuliani. President Trump’s attorney Rudy Giuliani ramped up the rhetoric against Robert Mueller on Thursday, calling for an investigation of the special counsel as he prepares to conclude his 19-month probe and issue a blistering report to the Justice Department. In a range of interviews with The Hill, Giuliani accused Mueller of destroying evidence for not including in the probe the text messages from now-fired FBI official Peter Strzok and his FBI lover, Lisa Page. “Mueller should be investigated for destruction of evidence for allowing those text messages from Strzok to be erased, messages that would show the state of mind and tactics of his lead anti-Trump FBI agent at the start of his probe,” Giuliani said. 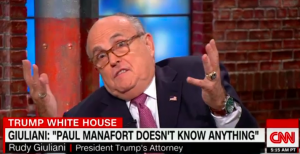 During the interview, Giuliani said no more questions will be answered from Mueller. The president is “not answering any more questions from these people,” Giuliani said. Posted: 12/28/18 at 2:16 AM under News Story.